Cadillac announced the world premiere of the Escalade Hybrid in 2008, the world’s first fuel-saving hybrid applied to a large luxury SUV at the time. Powered by an innovative, fuel-saving 2-Mode Hybrid system, Escalade Hybrid will deliver more than a 50-percent improvement in fuel economy in city driving – all while delivering the same distinctive style, segment-leading features and full-size capability that have made the Escalade an icon. Escalade Hybrid is available in 2WD and 4WD configurations. It delivers up to 6,000 pounds of usable towing capacity on 2WD models and 5,700 pounds on 4WD models. All of Escalade’s standard comfort and convenience features are included. This includes an eight-inch, touch-screen navigation system that displays performance readouts of the 2-Mode Hybrid system on the screen. GM’s patented 2-Mode Hybrid system consists of an advanced electrically variable transmission (EVT) and 300-volt nickel-metal hydride Energy Storage System (ESS). These systems work in concert with the standard 6.0L V8 Gen IV gasoline engine with Active Fuel Management (AFM) and late-intake valve closing (LIVC) technology. AFM enables the V-8 engine to seamlessly shut off half of its cylinders when less power is needed, such as during highway cruising. 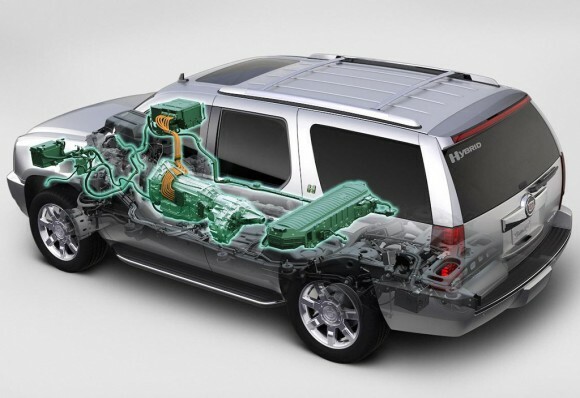 This new hybrid system not only enables the Escalade Hybrid to drive low speeds on electricity alone, it also allows the 6.0L V8 engine to operate in its more economical four-cylinder mode for longer periods. A new exhaust system and resonator specially tuned for the 6.0L LIVC engine’s Active Fuel Management operation. It ensures comfortable interior acoustics and a pleasant exhaust note during both V-4 and V-8 operation. An electrically driven, 42-volt variable-assist power steering reduces vibration and provides up to a 0.5-mpg fuel economy improvement by reducing parasitic losses common in belt-driven hydraulic systems. 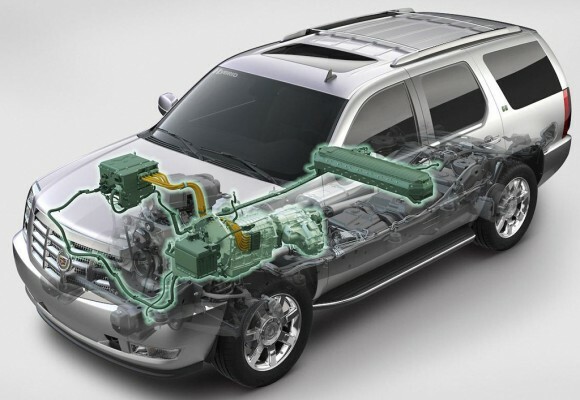 The Energy Storage System cooling system’s internal fan is tuned to be quiet at low vehicle speeds, when the fan could more easily be heard by the occupants.